Three hospitals in England have failed fire safety checks ordered in the aftermath of the Grenfell Tower fire. Buildings at London's King's College Hospital, Sheffield's children's hospital and the North Middlesex Trust have been found to have combustible cladding. 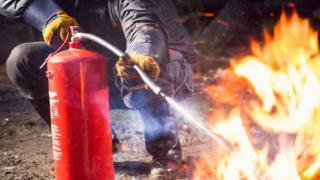 Those three trusts along with another 16 have also introduced 24-hour fire warden patrols to improve safety. Checks on cladding used at five sites have yet to be finished. Where have cladding tests failed? Of the three that failed, one - the building at King's College - is an office block and does not house patients. The other two sites have failed on buildings that house patients, but do not keep them in overnight. Steps are under way at all three to improve safety. But a spokesman for NHS Improvement, which regulates hospitals, said there would be "no disruption to patient services" while changes were being made. The urgent checks were ordered by Health Secretary Jeremy Hunt following the Grenfell Tower fire. A total of 38 trusts were identified last week as being of highest risk as they were already known to have been struggling with basic fire standards or had high-rise buildings that had cladding. The review has now found the cladding at 11 sites passed the checks, while the other 19 sites which flagged up potential fire safety issues have been told they do not need to take further action. King's College Hospital has already removed the cladding from its office building as a "precautionary measure", while steps are being made at the other two sites to remove it. In Scotland, health boards have confirmed combustible cladding has not been used on any buildings.